Last week students at St Paul’s celebrated excellent A level results with 61% achieving A*-B and 85% achieving A*-C. This led to 85% of students being offered their first choice university. This week it is the turn of the GCSEs. Overall 83% of students achieved a grade 4 or above and 56% grade 5 or above in English and Maths. This is an excellent result with the introduction of the new GCSE curriculum this year. Some exceptional results included the following students who achieved 8 or more grades 9-7 which are the equivalent of A* and A grades. 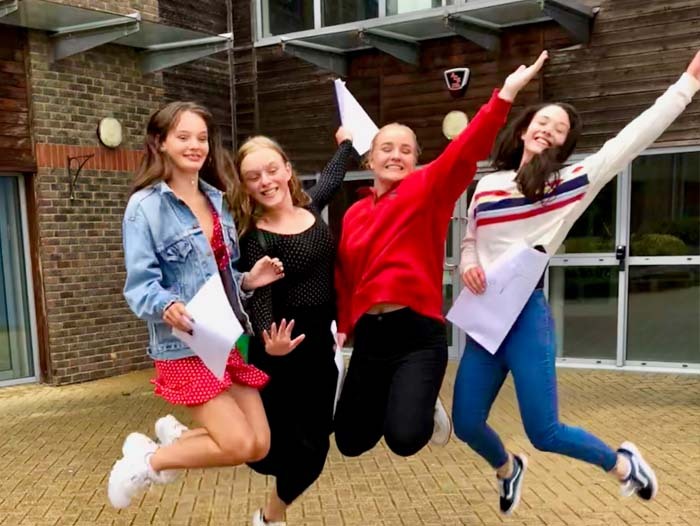 The three top performers were Lucy Barnard ten grade 9s and one grade 8, Sophie Atherton-Barnes nine grade 9s, two grade 8s and one A* grade and Ciara Howard who got nine grade 9s and two grade 8s. These grades are particularly impressive in that the new curriculum looked to stretch top performance and only the top 3% nationally were awarded grade 9s. I am thrilled to share in these with the results with the students today. We look forward to welcoming them and our new students back to study in the sixth form on 4th September. We are so proud of all the students and the hard work and dedication they have put in. To get these results in the new more challenging curriculum is down to their hard work, inspirational teaching and supportive families. We look forward to them flourishing in the next chapter. Registration for students joining the Sixth Form is on Tuesday 4th September. Please contact the school office for further details or to confirm the time of your induction interview.